The entrane [entrance] or vestibule to be in center of east end 4 ft. wide by 6 ft. wide in clear … two wardrobes on each side six ft. wide… to [be] fitted up neatly with shelving on one side and pin rails 2 in. wide on the other [suff]icient to contain eighteen closes [clothes] hooks placed ... apart in each to be of the best quality [si]milar pin rails to be placed on sides… of School room with hooks for hanging wraps of a hight [ height] to [be] designated by [directors?] the wardrobes to communicate with the school room by open arched doorway four ft. wide by eight ft. high six four windows to be in School room and on in each wardrobe. All the window frames will be made casing duble [double] hung with the best axel pulleys [patterns?] sash cord and weights, and secured on one side with shutters one + half inch thick made in pairs and in three equal panels sunken on one side and bead-----on the other hung with strap hinges and secured with ten inch shutter bolts and secured when open by hooks well secured to the window sills. The window sash to be one + half inches to be glaised [glazed] with the best American glass well bedded sprigged [?] and puttied. The size of glass to be eleven by fourteen inches, eighteen lights to each window all the would [wood] work usely [usually] painted to receive three coats of pine white led [lead] and best linseed oil and annoked [??] (start page 4) shuck Tints as the directors may direct. The joists to be raised 7 inches at the rear end of building six ft. wide @ black surface two feet from above platform and four feet wide to extend width of building to be of slate or other materials to be determined by committee, the outside door to be two inch [??]. The walls partitions and sealings [ceilings] to be lathed and plastered with two coats of brown mortar and one hard white finish. The brown mortar to be composed of fresh wood, burnt lime, and clean sharp sand, well haired. The lumber to be of the best quality and properly seasoned, and all the hardware nessary [necessary] to complete the building to be of the most approved kind and all other material and the workmanship required to carry out the specifications to be of the best quality and all to be done to the satisfaction of the director of the proper committee. and to be well covered with cement after having two coats of good mortar and the [lots?] and ends to have 4 in. moldings, the wainscoating under blackboard to be finished with a capp or ledge four in. wide to hold crayon. Four windows to be in schoolroom, two on each side and two in east and one in each wardrobe. Window frames will be made casing double hung with the best axle pullies, pattent-sash cords and weights and secured on outside with shutters 1 ½ in. thick made in pares [pairs] and in three equal panels sunken on one side and bead and but on the other hung with strap hinges and secured when open with 10 in. shutter bolts and secured when open by hooks well fastened to windowsill. The window sash to be one and half inches to be glaised with the best American glass well bedded, [thudge?] and puttied. The size of glass to be 11 [by] 14 in. 18 lights to each window, 9 in. each sash the partition and ceiling to be well lathed and with the wall to be plastered with two coats of brown mortar and with one of white hard finish. The brown mortar to be composed of fresh wood, burnt lime, and clean sharp sand well hared [haired] a frame 5 [by] 5 in. 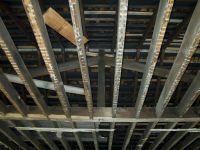 well fastened to ceiling joists of good sound pine and to extend up 4 feet above the roof to hang a bell to be roofed with same material and to have the same pitch as school house. The roof to extend 12 in. out (start page 6) from the posts all around to be faced and lined and boxed on underside of rafters supported by brackets and to be lined around with tin to exclude all rain. The portico to be build [built] over font [front] door 7 by 8 feet, the walls to be 18 in. thick, and the foundation to be 2 ft deep- to be of good building stone and good mortar, the walls to be built on three sides of sufficient hight [height] that the floor when laid well be on a level of underside of door. Sill to be filled in between the walls to the depth of 1 foot with small stones well laid in the floor. to be laid with large flat stones solidly laid in mortar and to extend over the wall 2 in. all around the posts. The in iron common water pipe securely fastened at bottom. A well to be dug in one corner of seller [cellar] and walled from bottom lip, 6 in. above level of seller [cellar] floor and covered with 9[?]in. white….and to have placed in same a good …of the most approved patterns to … up into the vestibule and to have a plain corner in iron enamel mesh fastened with … pipes of led [lead] 1½ in thick to extend through the hall. The porch sealing [ceiling] to be even with the finish on one of the celler.